APPSC released Marks of all Appeared candidates for Asst professors in AP Universities on 16th july.Andhra Pradesh Public Service Commission (APPSC) has successfully done with conducting the Assistant Professor examination as per the scheduled dates. Candidates aspiring to become Assistant professor have competed for the AP Assistant Professor examination. APPSC has conducted the Assistant Professor examination from 9th to 13th April 2018 (9.30 AM to 12.30 PM). This examination has been held at various examination centers across the state of Andhra Pradesh. The organization has released the AP Assistant Professor answer keys on 30th April for all the examinations. Candidates appeared for the examination have tallied the answers by comparing with the answers given in the answer key PDFs. 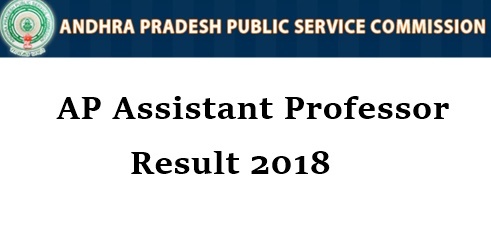 Candidates who have already analyzed the attempt and waiting for APPSC Assistant Professor result can shortly download the results from the official website, psc.ap.gov.in. Go through the article to check the details of APPSC Assistant professor result, cutoff marks, and other details. The Andhra Pradesh Public Service Commission has released the notification for 1109 Assistant Professor posts. A large number of candidates aspiring to get assistant professor jobs in government colleges have applied for the posts during the application dates. APPSC is going to shortlist the suitable candidates based on their performance in preliminary examination, mains examination, and interview rounds. The organization has conducted the AP Assistant Professor examination in the month of April. Candidates who had appeared for the AP assistant professor examination can soon check their result on PSC official website, psc.ap.gov.in. The APPSC is going to release the assistant professor results in the month of July (tentatively). Candidates appeared for the examination can stay checking the official website, psc.ap.gov.in to download the result. Candidates cleared the preliminary examination will be shortlisted for mains examination. The APPSC will soon announce the AP Assistant Professor result date, mains examination date on its official portal. Stay tuned to check more updates. Candidates have to score the minimum cutoff marks/qualifying marks in the assistant professor examination to clear the preliminary examination round. Candidates can check the details of APPSC Assistant professor cutoff marks 2018 from the following. Initially, visit the APPSC Official website, psc.ap.gov.in. Search for Assistant Professor result link on the homepage. Click on the link if available, and enter the necessary details such as login id, password etc. The APPSC Assistant Professor result will be downloaded.